Being married with a French means some French traditions too, especially the ones that feel the void in Italian traditions. One of this is the traditional cake French make for Epiphany. In Italy Epiphany is celebrated every year on the 6th of January, in France is the first Sunday of January. Italian tradition: during the Epiphany the Befana (an old woman flying on a broom) visits all the children and she gives socks to everyone with black charcoal (made of sugar) to the bad one, and gifts, like peanuts, oranges and sweets, to the good ones. French tradition: at the beginning of January a cake is sold everywhere: Galette des Rois. It’s a fairly simple cake, made of two disks of puff pastry filled with frangipane and a fève, a little ceramic figure. The little one of the house hide under the table and give the names of the people that should receive the piece of the cake. The person that finds the fève is crowned the king (roi). This recipe is inspired by Pierre Hermé’s Secrets Gourmands. To make the cream. Boil the milk. In the meanwhile, with a wooden spoon, mix in a saucepan corn meal, sugar and eggs yolks. Do not whisk, just mix. Slowly pour the milk over the egg mixture, mixing with the wooden spoon. Put it on a low fire and keep turning with your wooden spoon as long as the cream thicken. A simpler way to do it is with an hand blender: on an high fire, keep turning the cream with an hand blender until it thicken. No lumps guarantee! Leave it to cool covering the surface of the cream with film. To make the almond cream. Mix together sugar, almond meal and corn flour. 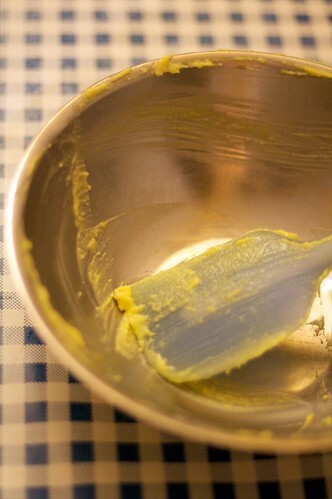 In a mixer, mix the butter until soft but not excessively fluffy. Add it to the almond mix. Add the eggs, one at the time, keeping mixing until all the eggs is incorporated. At last, when completely cold, add the cream you prepared first and mix until smooth. In a round (24 centimetre) baking tin, lay the first disk of puff pastry, keeping the borders high. Pour the prepared almond cream inside the drawn ring. Cover with the other disk of puff pastry and close tightly on the sides. Refrigerate for 30 minutes. In the meanwhile preheat the oven at 180° C.
Bake the galette for 45 minutes. This yields make a well stuffed galette: I like it that way! But if you prefer a thinner galette, halve the quantities for cream and almond cream. Nooooooo! ma tu sei un genio! Me la faceva sempre la mamma. L’hai fatta in mio onore vero? 😉 Peccato che però te la sia magnata tutta tu e yannickuccio!